This is a half-hour of gorgeous animation with brilliant use of music; it's just beautifully done, and one of my absolute favorites. It's wordless except for the short introduction and the one song. It's based on the picture-book of the same name, and the style of the animation looks just like a living illustration. The animation looks like it was done with pastel and crayon, and the skill that is evident in the work is astounding. Particularly amazing is the flying sequence, which uses just perspective and careful planning to convey an amazing amount of movement and depth. The song from this haunted me a while back, when I hadn't seen the special in years. I remembered that it was good, but not much else about it. When I finally tracked it down and sat Erin down to watch it, the opening strains of “Walking in the Air” began to introduce it, and I burst into tears. It's a melancholy piece, but all the more beautiful for that. I love this special, but it still makes me cry. 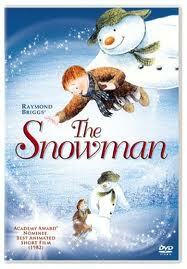 The Snowman is available on DVD . I remember that winter, because it brought the heaviest snows I had ever seen. Snow had fallen steadily all night long, and in the morning I awoke in a room filled with light and silence. The whole world seemed to be held in a dreamlike stillness. It was a magical day, and it was on that day I made the snowman. Unless you count the lyrics to "Walking in the Air," those are the last words in the special. It's Christmas. We Got You Something.